Breathtaking waterfront property with open floor plan and private dock. Location, Location, Location, - Beautiful waterfront property with private boat dock and swim platform. Bring your boat, jet skis or fishing poles. Enjoy multiple watersports including kayaks that are provided or just relax on the large deck that runs across the back of the home. Here you can barbeque, sit and enjoy a cup of coffee, or a glass of wine while enjoying the magnificent views, wildlife or watching the various water skiers. 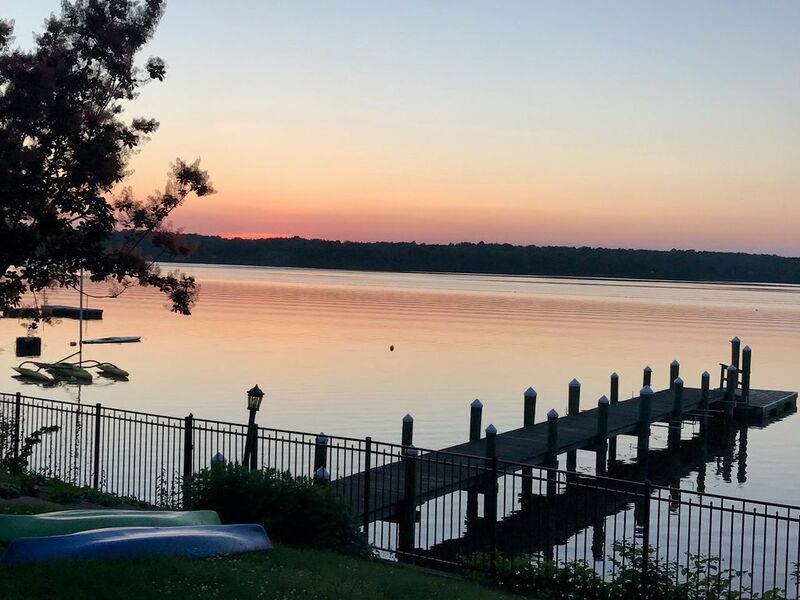 This home is located on the Elk River just minutes from multiple other waterways including the Chesapeake Bay. This home boasts a wonderful open floor plan, a gourmet kitchen with large island and marble counter tops. It is uniquely decorated and has amazing water views from the living area, kitchen and master bedroom. A separate fully furnished area downstairs for playing pool, games, watching movies or just extra space. The waterfront lawn is fenced in for added safety for children or pets. Enjoy the small town of Chesapeake City with great indoor and outdoor restaurants just minutes by boat or car. We love this home and want to keep it as our forever home. However, we are out of state on project assignment now so wanted others to get use out of this beautiful home. To see this home is to love it. It is well appointed and a great get a way. Beautiful home on waterfront with private dock and swim platform. We stayed in this beautiful home for a quick 2-day getaway. Walking through the front door is all you need to do to experience the amazing view of being right on the water. We had a party of 10 (4 adults, 6 teens) and this home suited us beautifully. The basement is finished with 2 twin beds and a pullout couch as well as a pool table. The kitchen is well-appointed, spacious and wonderful to cook in. The bedrooms make you feel like you're at home, the linens and mattresses are good quality and very comfortable. Tina and Drew provide many thoughtful touches throughout the home and you can see that they truly want their guests to feel welcomed. Definitely a wonderful place to stay!! A group of 8 women friends spent a girls weekend at Serenity over St. Patrick’s Day. We had booked in January and anxiously awaited the trip. Most of us live in the Philly area so this house was just a short drive. The home did not disappoint. As soon as you walk in the door you are met with an awesome view and you have that moment of “ahh”. The open concept and well supplied kitchen, dining and living areas made it easy for all of us to stay together and catch up. And the long dining room table was perfect for all of us to sit around. Being March, we were not able to spend much time outside, however, it was a bit nice when we arrived on Friday so we did get in about an hour of outdoor time on the deck overlooking the water. Again, another table that all 8 of us were able to fit around. The only slight drawback for us is that the twin beds are in the basement and the bathrooms located on the main floor. We were able to make it work though. Also note that if you are going to stay any length of time, the futon is not a great sleeping option although the room , while it is right next to the living room, is surprisingly quiet once the pocket door is closed. The consensus of the group is that we will definitely keep this in mind for another getaway in the future in warmer months. We really enjoyed our stay here. We especially liked the very nice kitchen with plenty of space to prepare family feasts. The giant windows overlooking a great view of the river was also wonderful. Plenty of room to host a family gathering in the main living space. We would definitely come back. Thank you Tina for the quick responses to our questions. We enjoyed our stay here! Many positives, including: very clean, comfortable beds, nicely decorated, beautiful kitchen, plenty of towels, lots of space to gather and visit with comfortable seating, and quiet. Thoroughly enjoyed our stay at Serenity. Beautifully appointed premiere property directly on the Elk River. We stayed in early December and sat by the warm fireplace while enjoying the spectacular views of nature from the many windows. No doubt, it’s lovely to sit outside on the expansive deck in warmer weather or paddle down the Elk in one of the provided kayaks. Tina and Drew are a pleasure to deal with and provide many special amenities including holiday decor and cheer during our stay. Would highly recommend this property. Minutes by car or boat to Chesapeake city with shops, outdoor restaurants and bars.